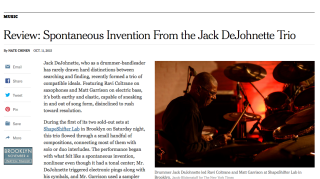 Jack DeJohnette, who as a drummer-bandleader has rarely drawn hard distinctions between searching and finding, recently formed a trio of compatible ideals. Featuring Ravi Coltrane on saxophones and Matt Garrison on electric bass, it’s both earthy and elastic, capable of sneaking in and out of song form, disinclined to rush toward resolution. Continue reading The New York Times concert review here.